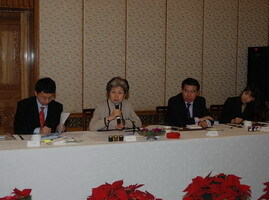 On November 30, 2007, the Chinese Embassy in the UK held a briefing on the 17th CPC Congress for mainstream UK media. More than 20 senior correspondents, editors and experts from BBC, Financial Times, The Times and The Guardian participated. H.E. Mme. Ambassador Fu Ying introduced the background, theme and structure of the report of the 17th CPC Congress and pointed out that it is a document directing future development of China. It summarizes the work of the past five years, makes clear the system of theories of socialism with Chinese characteristics, sets the development targets in 2020 and layouts the directions for future work in all fields. Fu Ying denoted that core messages from the 17th CPC Congress included: China will steadily deepen the reform and opening up, unswervingly stick to the road of peaceful development and thoroughly apply the scientific outlook on development. Minister-Counselor Pan Hejun, Minister-Counselor Wang Baoqing, Counselor Zhang Lirong and Counselor Liu Weimin introduced main contents of the report of the 17th CPC National Congress respectively. Fu Ying and the diplomats also answered questions on China's international responsibility, rural reform, military build up, financial stability and environmental protection. 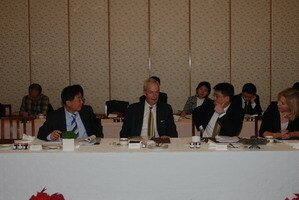 The briefing was full of interactions in an ardent and friendly atmosphere. 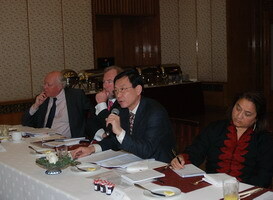 The participants highly evaluated the briefing. They said the 17th CPC National Congress is an important event not only for China but also for the world. The briefing is conducive for them to have a better understanding of the 17th CPC Congress and grasp the direction of China's future development. They hoped that the Chinese Embassy could hold more similar activities in the future.